When L'Oreal releases a new product, I am generally all over it in a heartbeat (which shows just how much of a huge fan I am), and this foundation was no exception. You may have seen me briefly talk about it in my what's new at the drugstore a few months back, so here I am today finally reviewing it for you guys. An exclusive long-lasting foundation that provides 24 hours of full coverage, with an ultra-light-feel. 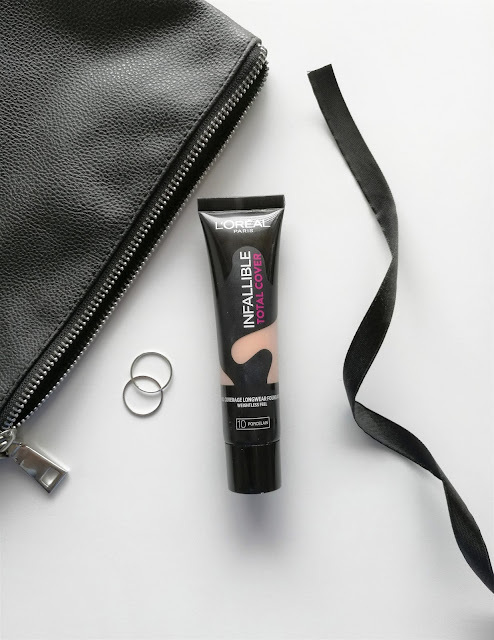 This foundation covers a large range of imperfections without overloading: redness, marks and dark spots. Zero cakey effect, no transfer and non-comedogenic. Ultimate spreadability and even full coverage thanks to the Camo Stretch technology. 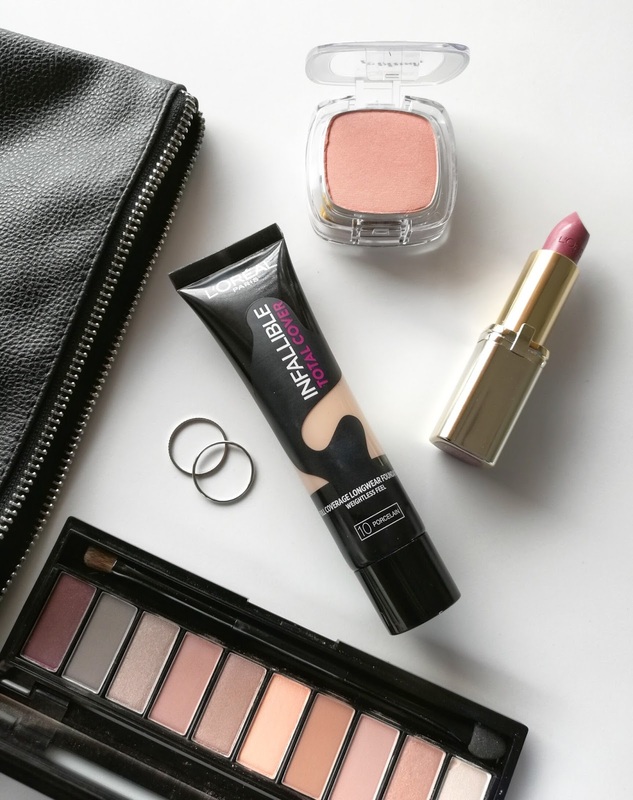 Very similar to their Infallible Matte Foundation with the squeeze tube which makes dispensing the product so easy and fuss-free. I love when foundations come in glass bottles simply because they feel expensive, but I actually don't mind the tube packaging; it's fantastic for carrying around in your makeup bag, especially if you're travelling by plane so you don't have to worry about it breaking and making an entire mess in your luggage. First impression wise it looks like a rather thick foundation, but it has this creamy mousse-like texture that feels extremely light on the skin. Because of how lightweight the formula is, it's so comfortable to wear and your skin can still breathe under all those layers of makeup. This claims to be a full coverage foundation and I completely agree. It covers redness easily as well as other minor imperfections however, I do need to come in with a touch of concealer to hide acne scarring. Besides that, I'm very pleased with the coverage so you don't need to layer on a heap of product to reach a full coverage finish. It is very much a matte foundation which I personally love and it looks really great on the skin. I like to use a damp makeup sponge when applying this and it blends so seamlessly for a flawless, full coverage finish that doesn't look or feel heavy. For me it didn't sink into lines or emphasize texture and dry patches too much so all in all, the finish is just lovely. I was out and about when I had this foundation on for well over 8 hours and I must say, it wasn't looking too amazing up close. It was still sitting on my skin and and there wasn't a lot of fading, but I'd say the reason might be due to my oily skin causing it to separate and look kind of cakey. Around the 8 hour mark was when my skin began feeling and looking like a hot mess and I just wanted to wipe it all off, so it doesn't perform the best for all day/night wear. Surprisingly though, it didn't transfer as much as other foundations I've worn so that's a positive. I have mixed feelings about this foundation. There are some great positives but there are also major negatives that I can't overlook. I think the best way that this foundation will work for me is if I'm just heading out for a couple of hours doing errands and whatnot. If I have a big day or night ahead of me I will need something that will stay put and look flawless during that time and unfortunately, this foundation just doesn't do it for me. Let me know how you feel about this foundation!